As a boy growing up in Philadelphia, I loved soft pretzels. They were everywhere. At the ballpark, the school cafeteria, or the corner shop, there was always a heating cabinet with hot pretzels hanging. On the streets around every activity happening in center city vendors sold them from stacks on dowelled contraptions, keeping a few pretzels warm to one side. You’d sink your teeth through the salty crust and into the chewy inside and get an explosion of yeasty flavor with every bite. A good soft pretzel could be a whole meal in a jiffy. ‘Too salty,’ my wife the Salad Queen said after tasting a tepid (modern) rendition. You know those refined English tastes. ‘Too plain,’ she said, and she was right. When I was a kid the best ones had a shiny surface that the salt just barely clung to and you could kind of scrape it off; nowadays, that salt is stuck on there for good. And the unsalted ones have no flavor at all, unless you add lots of mustard, which masks the yeastiness. So I developed this tasty new soft pretzel, with a snappy little seeded crust and not so much salt. A compromise, maybe. But that’s the secret to every great and lasting relationship. Note: I use the gomasio from World Spice Merchants here in Seattle, which contains both white and black sesame seeds mixed with Japanese sea salt. Other gomasios may vary. Make the dough: In a large bread bowl, mix the bread flour, spelt, brown sugar, salt, baking powder and dry yeast together. Make a well in the middle and pour in the water. Mix with the handle of a wooden spoon until the water and flour mixture are incorporated. Scrape down the sides and bring it all together in a ball of stiff dough. Put the dough onto a sprinkling of flour on a counter, invert the bowl to cover the dough and let it rest for 20-30 minutes. Rest and rise: Knead the dough for 5 minutes and, when soft and supple, stretch it to form a fat snake. Curl the dough snake in on itself, put it back on the counter, cover with the bowl and let sit for an hour or two. 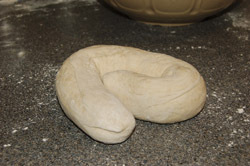 Fold your dough snake in thirds and knead for a minute or two to get the air out. (A dough this stiff doesn’t so much rise as plumps up.) Stretch it back into a fat snake, cover and let rest for another hour. Shape the pretzels: Roll your dough snake out until it is about 3 feet long, and cut it into 4 equal pieces. Roll each piece out until it is 25 inches long. You may have to let your dough rest a few times to accomplish this without tearing the gluten. Cut parchment to fit the sheet pans, and place the pans on a counter with the short edge toward you. Hold the ends of one dough rope and let the middle sag down to sit on the parchment two inches in from the edge. Let the rope of dough make most of a circle on the pan and then twist the ends once around to form a loose knot a few inches from the ends. Bring the tips toward you to overlap the curve of the dough, dividing the area of the circle roughly into thirds. Voila! You have made a pretzel. Repeat with the other pieces. Let the pretzels rise for 45 minutes, covered with a cloth. Make an assembly line: Preheat the oven to 375º and boil 3 quarts of water. Have a 12 inch sauté or frying pan ready on the stove. Put a rack to one side with a pan under it to catch the excess egg and seeds. Mix the egg and water until frothy in a ramekin and have a brush handy. When the pretzels have risen for 45 minutes, put the water into the sauté pan and bring back to a boil. Boil, coat and seed: Put a pretzel face down into the boiling water, for 30 seconds only. 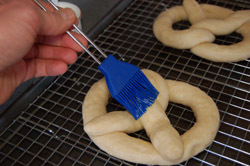 After 30 seconds, gently flip the pretzel with a spatula and boil on the other side for another 30 seconds. Remove to the rack. Brush the pretzels with the egg wash (I do two at a time), repeating to ensure a good coating. 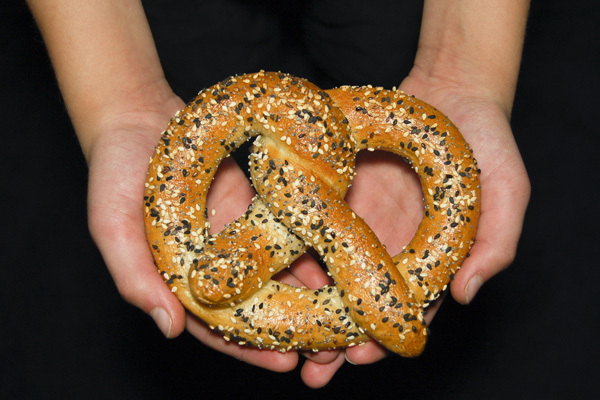 Sprinkle 2 teaspoons of gomasio, a little poppy seed and a sprinkling of salt onto each pretzel. Carefully remove to the parchment-lined pan from which it came. 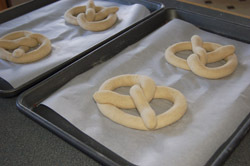 Bake the pretzels: If yours is a convection oven, you can bake two racks of pretzels at a time. 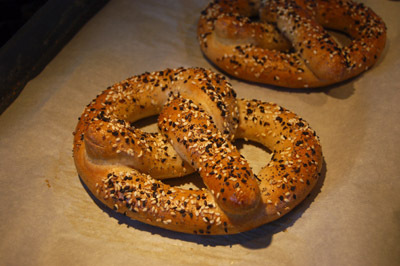 Bake at 375º for 10 minutes; switch racks and turn the pans and bake a further 10 minutes for perfect pretzels. For a standard oven, bake at 400º, one pan at a time, for about 20 minutes or until lightly browned. Wow – they look absolutely perfect! Great job. Don’t you just love those silicon basting brushes? Did you make these for superbowl? That is awesome. Your talent is amazing. The pretzels look better then any pretzel stand! To continue: as my computer went ballistic…. What I remember seems to differ from what is offered these days. Not shiny, not fresh. What happened? Yes, best make your own. They look perfect! Gorgeous. I’m a Pennsylvania girl living in Seattle and miss so many foods from the East coast. This is high on my list. 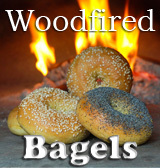 Do you have a good bagel recipe? I haven’t been able to find quite the right one yet. every time i see a soft pretzel recipe online i get the same feeling as when i see cheesesteaks from alaska – if you didn’t grow up on it, how do you know how perfect the food is? you’re a philly boy – me, a philly girl – i trust you on this. i agree that they are almost always too salty (i always, even as a kid, was seen throwing the salt on the floor, whether it be of wawa, the spectrum or the street) but too plain? hells no! there’s nothing as satisfying as a perfect philly soft pretzel with nothing on it (except maybe a bit of mustard). the dough is perfect to me! but i will say, your jazzed up version looks beautiful… i’d totally hit it! and i wouldn’t throw those seeds on the ground! gotta check out your blog now! great looking one. thanks for this post. i’ve written a few things on our blog about philly/south jersey stuff (the shore, softshells, wawa love, white house subs, scrapple, taylor pork roll, etc. )… they are some of the most loved posts. philly people are fiercely patriotic! Those look delicious! It has been so long since I’ve had a pretzel like that! aw wow i did not know you had posted a recipe for this! i have gone a little crazy making pretzels recently but they haven’t been quite right i think i may have to give your recipe a whirl! Hello There. I found your weblog using msn. This is a very well written article. I’ll be sure to bookmark it and return to read extra of your useful info. Thank you for the post. I will definitely return. 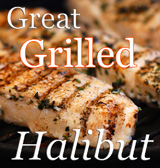 If you’re having a tough time finding a good gomasio for this recipe, I used RawSpiceBar’s freshly ground gomasio spice blend and it was wonderful in this dish.